Annihilation's unusual approach to distribution may have you worried even before it hits theaters and Netflix. Don't be. The next film from the writer and director of Ex Machina (and one of our most anticipated upcoming horror movies) will debut on Netflix a few weeks after its US opening date of February 23. If these early reviews are anything to go by, you're in for a memorably weird sci-fi experience whether you watch it on the big screen or from your couch. Here are some key critical snippets to consider. "Yes, this is the kind of film where you might find yourself turning to your movie-mate and whispering 'How GREAT is this!' just as your companion is putting the popcorn under the seat and is about to suggest cutting your losses and getting the heck out of there [...] The world inside the contaminated zone is alternately horrifying and beautiful. Wild mutations abound, from breathtakingly beautiful flora to heart-stopping fauna. [...] Annihilation becomes ever more trippy and challenging - and thus ever more interesting." 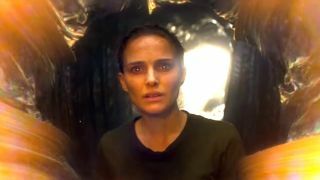 "Annihilation falls neatly into a familiar tradition of survival stories stretching from Joseph Campbell to Ridley Scott, but it carries those tropes with a degree of confidence that leads to more far-reaching results in its climax, a satisfying and sometimes brilliant dose of Kubrickian storytelling that digs deep and goes visceral at the same time. [...] Annihilation inevitably stumbles on some of the crasser aspects of its survival thriller roots, including the raving maniac who gives into her nerves and threatens to derail the whole ordeal. However, Garland never loses control of the genre’s boundaries, instead using them to stabilize the story before catapulting to more ambitious heights." "It’s hugely refreshing, and remarkably uncommon, to watch a genre film that revolves around intelligent characters reacting intelligently to fantastical events. The team is made up of briskly efficient problem-solvers who remain practical and focused while dealing with otherworldly mayhem. Unlike so many superficially similar films, as an audience we understand and empathize with the decision-making process, the script never sacrificing its smarts for suspense. It’s tightly constructed and devoid of unnecessary exposition yet the characters mostly feel like they are more than their various professions. This is also down to a strong set of performers and while it’s rare to see an all-female ensemble in a film of this ilk, Garland has little time for gender, imagining a future where such distinctions don’t warrant recognition." Garland sets an elegantly eerie mood with the astutely judged help of cinematographer Rob Hardy's striking lateral tracks and mix of greens and colors resembling rotting fruit; physically, the film Annihilation most resembles is Walter Hill's visually lustrous 1981 action drama Southern Comfort. The rumbling, churning electronic score by Ben Salisbury and Portishead's Geoff Barrow, who previously collaborated on the score to Ex Machina, finds a path directly to the viewer's anxiety button and presses it incessantly. "There were some interesting sci-fi ideas that were brought up once it’s clear what The Shimmer is…but there was no follow-through. The film as a whole didn’t seem to have much of a point of view. It told me a story, but it didn’t tell me why. What was Garland trying to say with this film? I don’t really know. An argument could be made for several things, but generally, if you’re trying to say everything, you’re not saying much of anything." "In keeping with the Twilight Zone tradition, the ultimate explanation is no explanation at all, but an ambiguous tease intended to cast everything that has come before in doubt. And yet, by leaving things open-ended, Garland raises questions beyond those of VanderMeer’s novel, shifting the focus away from hard science toward the psychology of his characters, and introduces a compelling dilemma, à la Arrival, that gives the film a welcome philosophical depth."